An inspiring healing journey of comrades facing the ultimate battle. This man and this dog are there for each other at exactly the right time for miracles to occur. 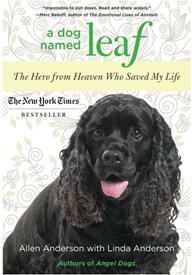 A Dog Named Leaf is at local and chain booksellers and online bookstores including amazon.com and barnesandnoble.com. 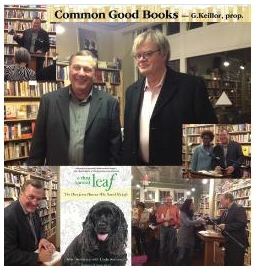 Garrison Keillor visited Common Good Books, the bookstore he owns in St. Paul, Minnesota, on the night of a very successful book event for A Dog Named Leaf. Thank you, Garrison, and all the people who launched this new book with us. 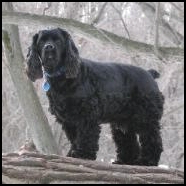 "Part 'Marley and Me' and part Jon Katz... the story is endearing, and the many photographs of Leaf running, swimming, and chasing a tennis ball in south Minneapolis are adorable." 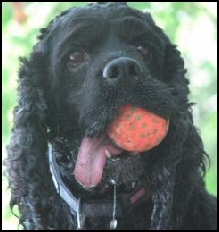 Watch "This Dog for President" The First Cocker Spaniel to Run for President! Shortly after Leaf’s arrival, Allen, who had spent eight years asa big city police officer and survived so many close calls that Linda called him “Miracle Man,” received a diagnosis from his doctor that made him think his luck had finally run out. 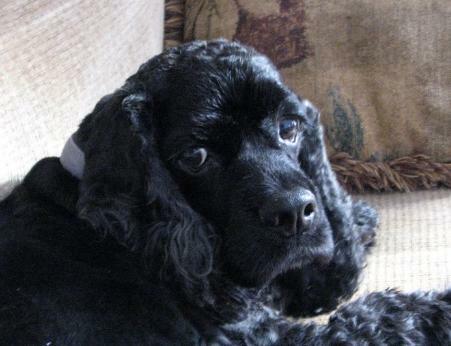 Allen had an unruptured brain aneurysm that could be fatal, and the surgery to repair it might leave him debilitated. Having seen his father live for years with the effects of a massive stroke, he dreaded that the worst fate might not be death.